Home » News » Alumni » Alumnus James K. Nelsen to give talk on Tuesday, February 23, at 4 p.m. Alumnus James K. Nelsen to give talk on Tuesday, February 23, at 4 p.m.
History department alumnus Dr. James K. Nelsen will be giving a talk on campus based on his new book, Educating Milwaukee. The talk takes place on Tuesday, February 23, at 4 p.m., in the Library 4th floor conference room. 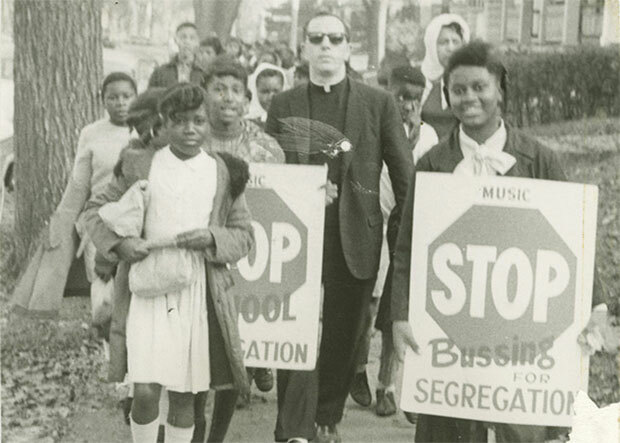 Join us as James Nelsen discusses his recent book, Educating Milwaukee: How One City’s History of Segregation and Struggle Shaped Its Schools, which traces the origins of the modern school choice movement. Nelsen follows Milwaukee’s tumultuous education history through three eras–“no choice,” “forced choice,” and “school choice.” Nelsen details the whole story of Milwaukee’s choice movement through to modern times when Milwaukee families have more schooling options than ever–charter schools, open enrollment, state-funded vouchers, neighborhood schools–and yet Milwaukee’s impoverished African American students still struggle to succeed and stay in school. Educating Milwaukee chronicles how competing visions of equity and excellence have played out in one city’s schools in the modern era, offering both a cautionary tale and a “choice” example. James Nelsen has a PhD in urban history from UWM. He is a high school social studies teacher at Golda Meir School. The event is free and open to the public. Accommodations for people with disabilities can be made if requested ahead of time by calling (414) 229-6980. The event is organized by the UWM Archives and UWM History Department. Funding generously provided by the Friends of the Golda Meir Library.